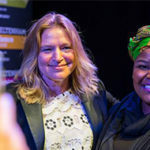 FameLab SA winner, Emmie Chiyindiko from the University of the Free State, put South African science on a global platform when she spent the week at the Cheltenham Science Festival in the UK, ahead of the FameLab International finals. The science-filled week began with a science communication training session with head FameLab trainer, Malcolm Love before participants took to the stage to share their research. Malaysia’s Siti Khayriyyah Binti Mohd Hanafiah became the 2018 FameLab International Champion – taking the prize from reigning champions, South Africa. Congratulations! Not just a competition, FameLab aims to enrich the participants through exposure to new research and ideas. During the festival, the group was shown an exhibition on the history of humanoid robots, heard a talk about the evolution of communication from the perspective of psychology, linguistics and primatology, got the low-down on covert, off-grid tactics used by the police, and enjoyed a musical performance with image projection and video representation of the fundamental processes within living cells. No doubt each finalist will return home inspired, equipped with excellent science communication and public speaking skills and a host of new friends across the world.